Many of our more exotic types of pets are found in exotic locations. Brazil is home to many different kinds of animals thanks in large part to the rainforests that cover about 60% of the country. Unfortunately, many of Brazil's animals that are kept as pets are still part of the illegal exotic pet trade. Some of these animals are found out in the open, as we discovered during the 2016 Olympic games in Rio, while others are a little less obvious to see. These large rodents love to hang out on golf courses where they munch on grass at night. Capybaras resemble large guinea pigs and are very tame. They are semi-aquatic, so they spend a good amount of time both on land and in water, as they can hold their breath for up to five minutes. 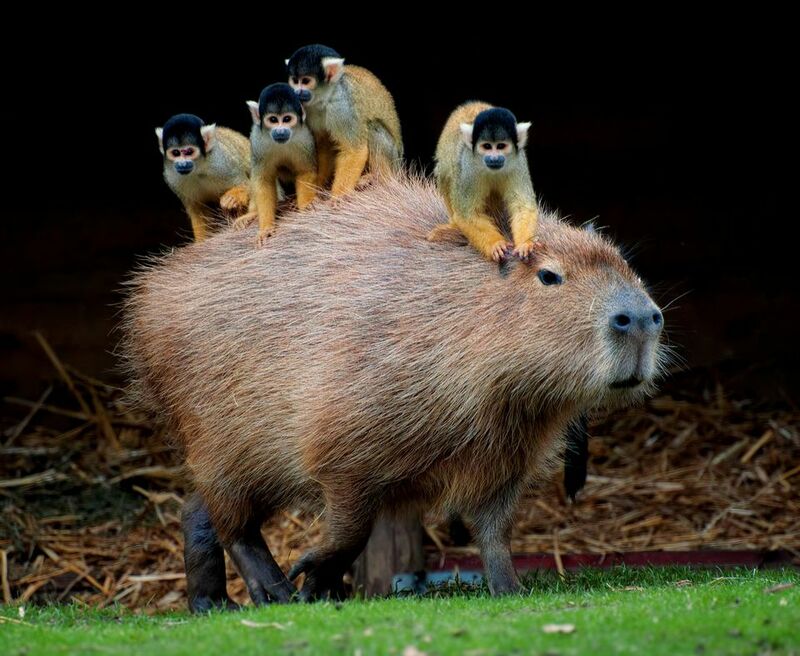 They enjoy eating a variety of plants and live in groups of other capybaras. Capybaras are kept as pets by some people, but due to their large size, water requirements, and food requirements, they are not recommended as such. Capybaras will wade and swim in lakes and rivers and graze on the grass in their enclosures as exotic pets. To truly create an appropriate environment, you would need a pool that your capybara could walk into that is also filtered without chemicals. This takes up a lot of space and money. A pasture to graze on is also something that would need to be provided. A fence around this pasture to keep your capybara safe inside is another cost to consider. The three-toed sloth is often found in Brazil, but they do not do well in captivity, despite the efforts of wildlife traffickers. Two-toed sloths are more popular in the pet trade but still don't make good pets. They spend much of their time in trees and are easily stressed. They require a special diet, temperature, and humidity, making them extremely difficult to care for as a pet. They are extremely cute and can't move quick enough to really hurt you. Primates do not make good pets, but that doesn't stop some people from keeping them as such. Howler monkeys, tamarins, spider monkeys, capuchin monkeys, marmosets, and squirrel monkeys are some of the more commonly seen kinds of monkeys in Brazil. The Amazon rainforest is home to most of these critters and is also a popular spot for wildlife traffickers. Capuchin monkeys are a popular kind of pet monkey and are still found in homes across the country, despite how difficult they are to keep as pets. Wildlife traffickers often, unfortunately, steal newborn monkeys from their mothers and sell them in the illegal exotic pet trade, making pet monkeys even more controversial. If you spend any time in a rainforest in Brazil, you are sure to see some monkeys. Pet monkeys are kept in diapers throughout their long lives, get into everything in your house, and are illegal to own in many states. The diseases they can transmit to humans are also good reasons to not have a monkey as a pet. Monkeys are better left in the rainforests of Brazil and other locales. There are several different kinds of boa constrictors, but the most popular one in the exotic pet world is the red tail boa from Brazil. Hot and humid, Brazilian rainforests are home to many snakes. Boa constrictors are often seen in South America because they are so large and multiply rapidly. Don't be alarmed if you see a boa constrictor though, because they are not venomous. Some of these snakes grow to be over 10 feet long and weigh in at over 50 pounds. Concerns over safety with children and small pets have brought boa constrictors to the media's attention, but many smaller species are readily available as exotic pets. Escaped and released boas are also a concern for ecosystems that did not originally have these large snakes. Florida is one such area that has been affected by the rapidly multiplying, large snakes that are taking over the ecosystem. There, efforts to eradicate invasive boa constrictors have been made. These are often described as small alligators, but the black caiman in Brazil is far from small. Caimans are found in the waters of Brazil, especially the Amazon River, where they eat fish, other reptiles, mammals, and really any other animal if it is available to them. They grow to be over 15 feet long and, despite what some people think of it, there are people who keep these large reptiles as exotic pets in their homes. Caimans are dangerous, expensive to feed, and require a large semi-aquatic environment complete with appropriate heat, UVB lighting, and humidity. They are hardy reptiles, but they don't make good pets. The risks associated with owning a reptile of this size and this number of large teeth is not something that should be taken lightly. Many of our exotic birds are from the rainforest in Brazil. Macaws and conures are popular pets and are also seen flying in the treetops and perching on branches around the beautiful countryside. Wildlife traffickers also target these brightly colored creatures, often stealing unhatched eggs or hatchlings from nests when the parents are away. In Brazil, you'll find birds of all kinds no matter where you go. Birds are common pets but we don't often care for them as well as we should. Free flight is not something that most captive birds get despite it being such a natural thing to do. Birds are also highly social and live in flocks that communicate in the wild. Each species has their own language and this is not something we can mimic as a human. Providing a bird companion is often recommended, but some people don't like the trade-off in attachment when their bird bonds to another feathered friend. Coati, known commonly as coatimundi, are the large raccoons of Brazil (weighing over 15 pounds full grown). They are more like monkeys than North American raccoons and are very active. They are found in the rainforests and mountains eating a variety of foods. As pets, they can become quite dangerous and violent, much like a monkey, especially if they are not raised at a young age and handled regularly. They need a lot of exercise with things to swing on, climb on, and explore. They need physical and mental stimulation and a lot of room to do so. Coati have a number of sharp teeth and claws that can both do some damage. Declawing and removing teeth are not humane things to do therefore good training, environmental enrichment, a secure enclosure, and plenty of space is needed to keep coati (and you) safe. You don't want to be face to face with an angry coati. Make sure you are purchasing a captive bred animal after you've thoroughly done your research on the needs of that animal and can meet the commitment requirements for caring for that animal throughout its life. Some of these animals are fairly easy to care for, such as the red tail boa and small conures when they have compared them to their more difficult fellow Brazilians such as the caiman or monkeys, but that doesn't mean they would make a good pet for you. For most people, it is probably best just to fall in love with Brazil and the animals that live there and not try to recreate the environment at home.